In Thailand’s Huai Kha Khaeng (HKK) Wildlife Sanctuary, tigers (Panthera tigris) are roaring back thanks to major long-term effort to reduce poaching. Ranger patrols have increased from 19 per month in 2006 to 144 per month in 2017. As a result, tiger numbers in the sanctuary have risen dramatically, from 41 in 2010-11 to 66 today – a more than 60 percent increase. In addition, tigers dispersing out of HKK are providing a foundation for a recovering population across the entire Western Forest Complex of Thailand, with benefits even spilling over across the border into the Taninthayi region of Myanmar. Humpback whales (Megaptera novaeangliae) inhabit all of the world’s oceans and are distributed around the globe in a number of distinct populations. In New York City, humpbacks can now be seen literally breaching off of local beaches. Nearly 20 years of research by WCS now suggests a more hopeful future for these whales. Analyses from WCS and partners presented and reviewed at the International Whaling Commission indicate that humpback populations occurring in the waters of coastal Gabon and Madagascar (and the breeding populations to which they belong) might have recovered to as much as 70 percent and 90 percent of their pre-whaling numbers, respectively. Internationally, most humpback populations have increased as a result of worldwide protection, and all but four of the world’s populations have been removed from the U.S. Endangered Species List. In addition to studying humpback whale populations around the world, WCS also monitors humpback and other whales in its own backyard through the New York Aquarium’s New York Seascape program. The Burmese star tortoise (Geochelone platynota) is found only in Myanmar’s central dry zone. Burgeoning demand from wildlife markets in southern China beginning in the mid-1990s virtually wiped out this tortoise species in a matter of years until it was considered ecologically extinct. In response, WCS began an active breeding program in conjunction with partners from the Turtle Survival Alliance and the Myanmar Government. Beginning with an estimated 175 individuals (most confiscated from wildlife traffickers), WCS and its partners established three “assurance colonies” at facilities within existing wildlife sanctuaries to hedge against the extinction of this species. Herpetologists and veterinarians from WCS’s Bronx Zoo helped design the breeding centers as well as provide husbandry and veterinary expertise to care for tortoises, some of which have already been released into carefully monitored protected areas. Today, there is an astounding 14,000 plus wild and captive animals. Approximately 750 animals have been released into wild areas of the sanctuaries, with more planned for release this year. Protection of the flooded forest on Cambodia’s Tonle Sap—Southeast Asia’s largest lake—by community rangers has brought the world’s rarest stork, the greater adjutant (Leptoptilos dubius) back from the brink. Previous unregulated collection of eggs and chicks had caused populations to plummet. At the same time, destruction of its flooded forest habitat threatened its primary nest sites. Working with the Cambodia Ministry of Environment, WCS paid local people to guard nests rather than raid them. On tree-top platforms, community members vigilantly protected nests throughout the breeding season. The birds rapidly increased in number. Today, the greater adjutant population has grown from a mere 30 to over 200 pairs (50 percent of the global population of approximately 800-1200 mature greater adjutants) in just over a decade. Work with the local Sam Veasna Centre has helped this thriving waterbird colony to become an important tourist destination, bringing economic benefits to communities protecting birds and nesting trees. The Kihansi spray toad (Nectophrynoides asperginis) is the first amphibian species to be successfully restored to the wild after being declared extinct in nature. Twenty years ago, the construction of a hydroelectric dam above the gorge dramatically changed the mist environment relied upon by these unique toads—found nowhere else on earth. Before these toads were classified as Extinct in the Wild by the International Union for Conservation of Nature (IUCN) in 2009, the Bronx Zoo was asked by the Tanzanian government to collect and breed these toads as a safeguard against extinction while an artificial misting system was created to replicate the spray zone from the gorge’s waterfall. Since the new misting system was established, the Bronx Zoo has sent approximately 8,000 toads to Tanzania, with the latest release of 1,000 zoo-born Kihansis released in 2016. The breeding and release program is the result of an ongoing partnership between the Bronx Zoo, Toledo Zoo, Tanzanian government, and World Bank. In Indonesia’s Bogani Nani Wartabone National Park, endemic and endangered maleos (Macrocephalon maleo) are rapidly recovering, thanks to solid efforts focused on nesting ground management, semi-natural hatcheries, and local guardianship. The national park’s law enforcement foot patrols, supported by WCS, cover approximately 250 miles (400 km). Increases in the number of eggs being laid per day are evidenced at four sites, and over 15,000 maleo chicks have been released into the wild. This program had its start at WCS’s Bronx Zoo, where the parameters for successfully incubating the eggs was developed and until recently was the only place where the maleo existed outside of Indonesia. Technology is also due to play a role in the maleos’ future, with novel drone deployments planned to improve knowledge of their habitat use and the detection rate of tagged birds. In Guatemala’s Maya Biosphere Reserve (MBR), the endangered scarlet macaw, (Ara macao) is soaring back thanks to conservation interventions. Until recently, threats like poaching and habitat loss have pushed this iconic species toward extinction in Guatemala, and only about 250 persist in the MBR. Over the last 15-plus years, WCS has intervened through an integrated approach, including law enforcement monitoring, community-based conservation, field science, aviculture and husbandry, such as incubating eggs and hand raising at-risk chicks. This led to significant success, with the highest fledging rate in 17 years of monitoring – 1.14 average fledglings per active nest. More broadly for the MBR, there is also good news. For the first time in 17 years, the east region showed increased forest cover in 2016-2017. 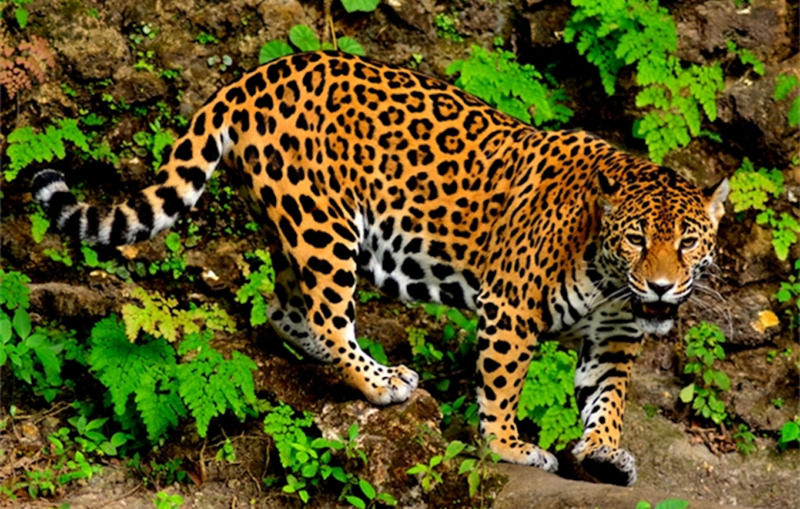 The largest cat in the Americas, the jaguar (Panthera onca) has been threatened by habitat depletion due to the conversion of forest for development and agriculture, and killing in response to the loss of livestock. The jaguar is now restricted to the extreme northern limits of Argentina in its southern range, while it has been eliminated across much of its historic range in Central America. For more than 30 years, WCS has worked to conserve jaguars in their critical strongholds, including enhancing protected area management, improving law enforcement, supporting indigenous peoples who manage lands, and reducing human-jaguar conflict. Thanks to work in collaboration with partners, jaguar populations remained stable or grew steadily at all WCS sites between 2002-2016. The growth rate averaged 7.8 percent a year across our sites, with a 3-fold increase in Bolivia’s Madidi National Park alone. Jaguars have shown signs of recovery in their northern range and may possibly return to the southern U.S. These results bode well for the future of jaguars. In the early 1900’s, the bison was on the verge of extinction – numbering fewer than 1,100 individuals after roaming North America in the tens of millions only a century earlier. WCS field and Bronx Zoo conservationists have worked to protect and restore bison since the early 1900s when our founder, William Hornaday, rallied conservationists, politicians, and ranchers to start new herds of bison at nine locations around the U.S. This early campaign to spare the law few hundred bison evolved into the first major wildlife conservation success in world history. Today, WCS seeks to advance bison conservation again by working with tribal, government, and private ranching partners to increase the number of wild bison in North America, reduce conflict between bison and cattle, and inform federal bison management with the best available science. Since 2008 WCS has successfully facilitated a collaborative effort to restore free-ranging bison to the Crown of the Continent. The four tribes of the Blackfoot Confederacy, Glacier National Park (U. S.), Waterton Lakes National Park (Canada), Montana Fish, Wildlife & Parks, and other parties have drafted a shared management plan to allow the bison to roam freely across administrative and international boundaries. The plan was endorsed by these agencies and by the Blackfeet Nation Tribal Business Council in 2018, and in 2019 we are working to locate a parcel of land on which to reintroduce the 89 bison slated for release. The Bronx Zoo currently has a breeding program to establish a herd of pure bison with the goal to be able to provide animals for restoration programs in the American West. MISSION: WCS saves wildlife and wild places worldwide through science, conservation action, education, and inspiring people to value nature. To achieve our mission, WCS, based at the Bronx Zoo, harnesses the power of its Global Conservation Program in nearly 60 nations and in all the world’s oceans and its five wildlife parks in New York City, visited by 4 million people annually. WCS combines its expertise in the field, zoos, and aquarium to achieve its conservation mission. Visit: newsroom.wcs.org. Follow: @WCSNewsroom.